The classic puff pastry is the base of many wonderful pastries. 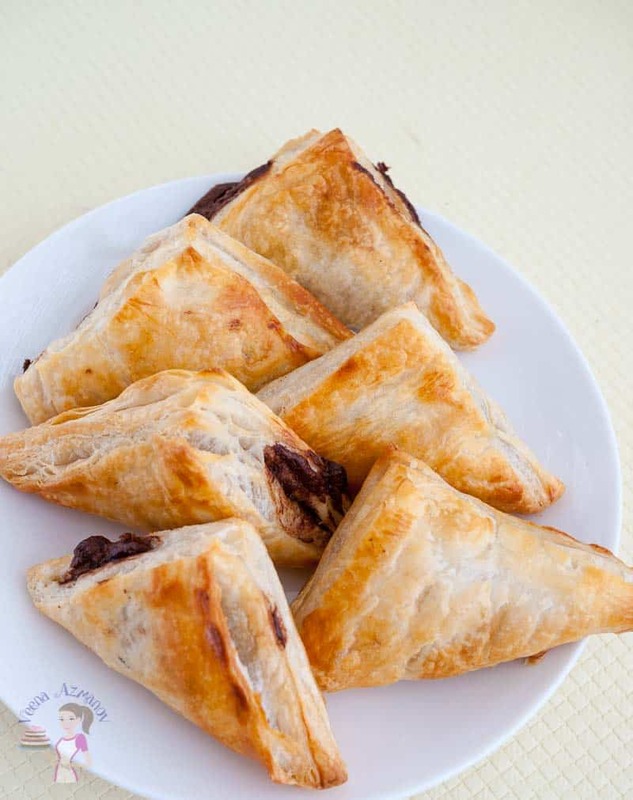 Create sweet or savory treats, breakfast to desserts, using homemade puff pastry. And it’s flaky, buttery, and much better than store-bought. 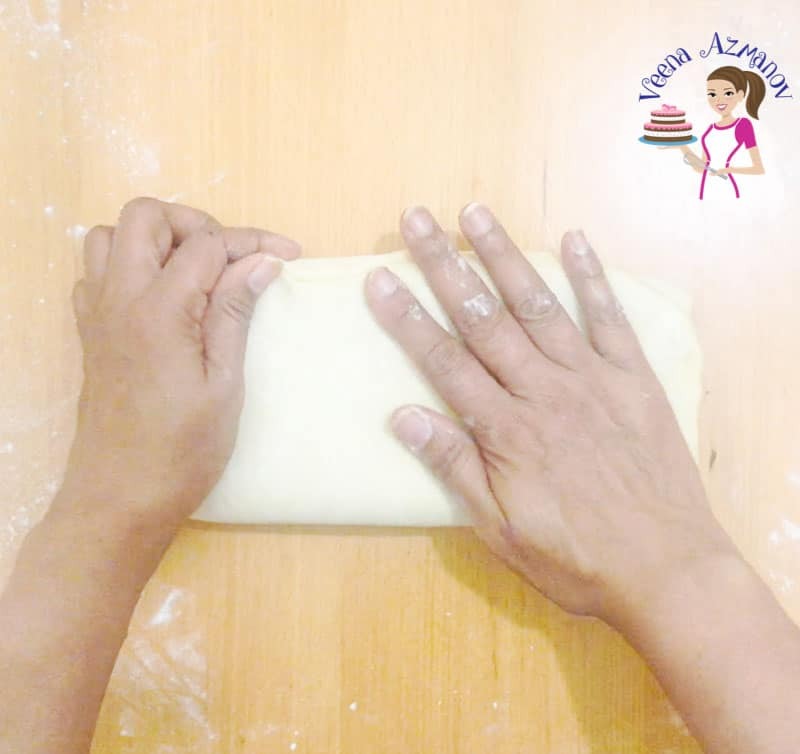 Learn to make puff pastry from scratch using my no-fail method, step-by-step progress pictures, and video. 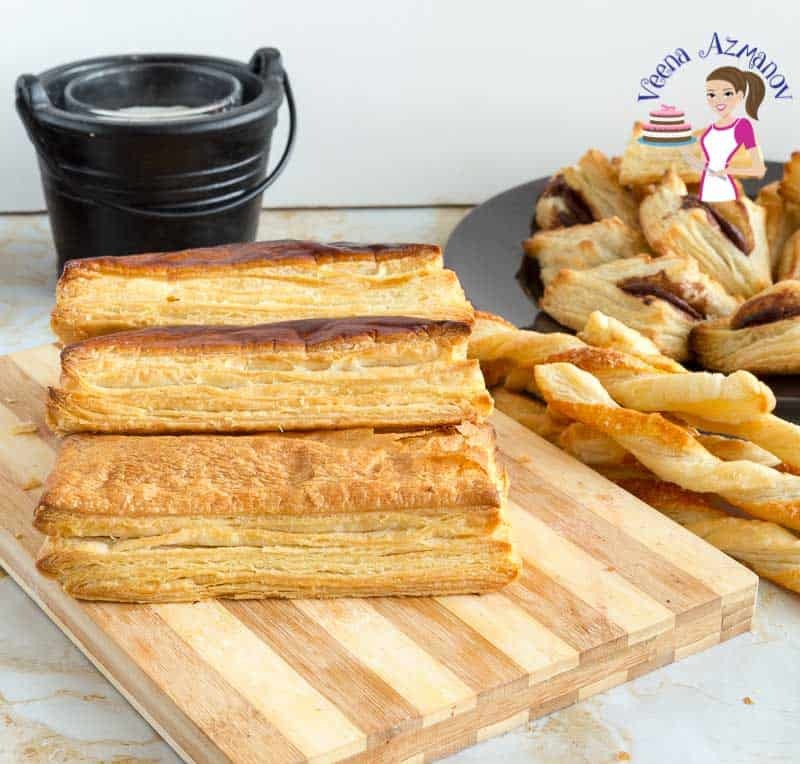 If you bake often, then you must have used this wonderful light, crispy and flaky pastry dough called puff pastry. 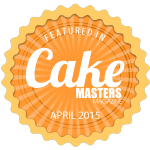 A base to make many wonderful treats, both sweet and savory. 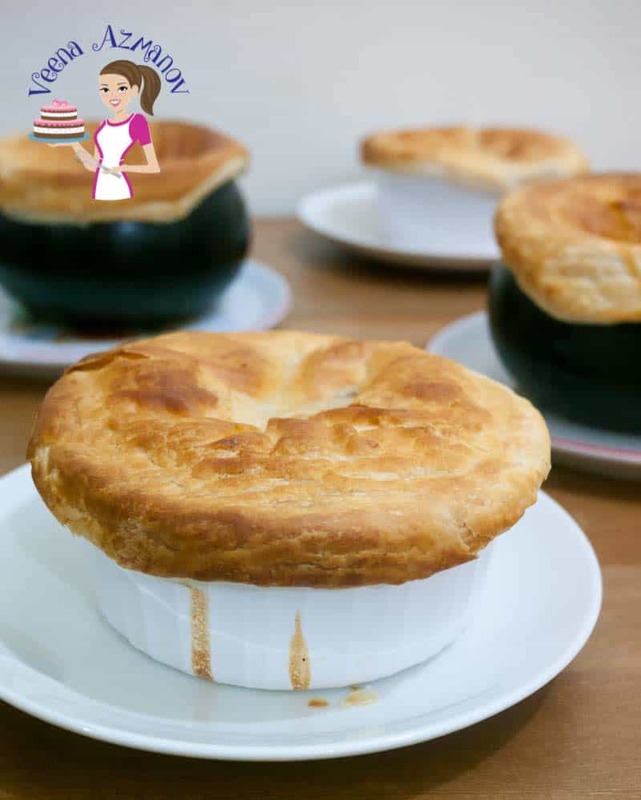 We use it to make savory dishes like chicken pot pie and quick puff pastry pizzas, as well as in desserts like Napoleon, Nutella puffs apple turnovers and more. I think the reason we use it so widely and so often is because we can buy it off the shelf rather than make it ourselves. Did you ever wonder why we don’t make it at home? 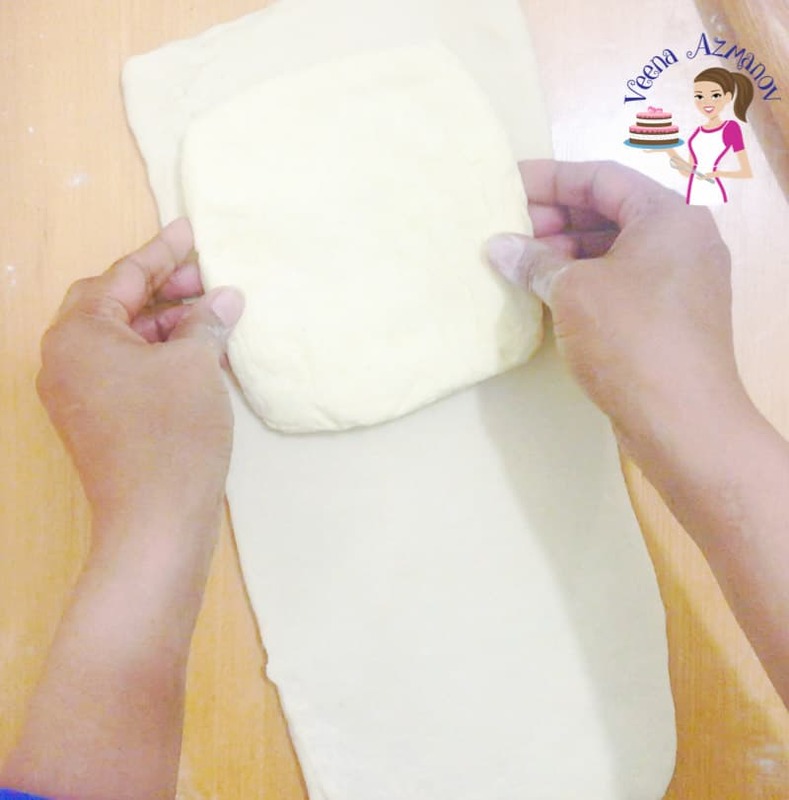 Do you want to know how to make puff pastry yourself? 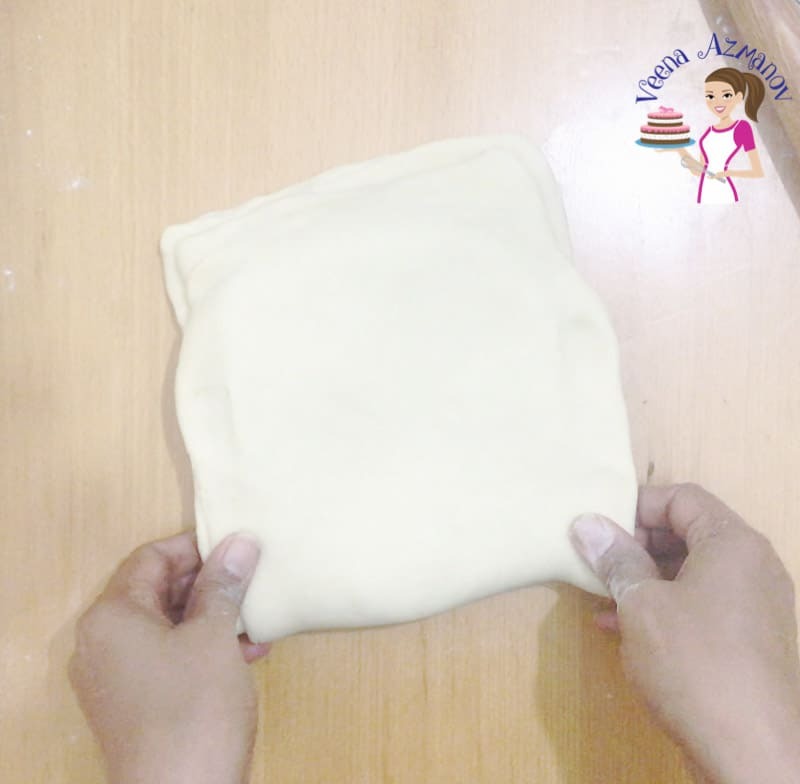 Well, today, I will share with you everything you need to know about puff pastry, including my no-fail recipe and fool-proof method for making it yourself perfectly every single time. And I know that those of you that like a little challenge, will perhaps make an attempt to making your own puff pastry, and I hope the rest of you will realize how lucky you are to be able to pick it off the shelf. The classic puff pastry is also known as Pâte feuilletée. In French, it means layered dough (laminated dough). 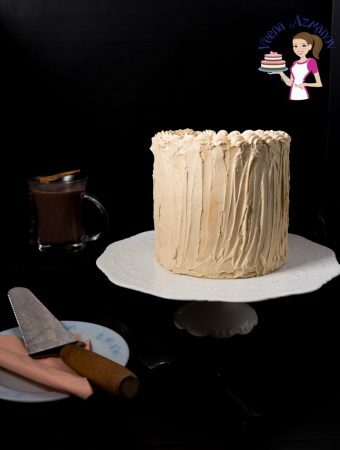 The layers are made with just three main ingredients flour, water, and butter. And there is no leavening or yeast in the classic puff pastry. 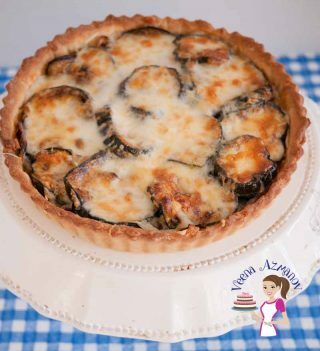 The puff pastry is made up of three parts — The flour knows as the détrempe in French, the butter block which is known as the beurrage, and the Pâton, which means the package of dough by combining the two, flour and butter block into one. What is the puff is puff pastry? The butter block or beurrage is folded into the flour through a number of folds or turns known as tours in French. These fold helps create layers of butter and flour. Furthermore, these layers of butter make the dough rise in the oven during baking. The butter turns into steam and pushes up the layers of dough, thus creating a puff. And this is what creates the puff in puff pastry. 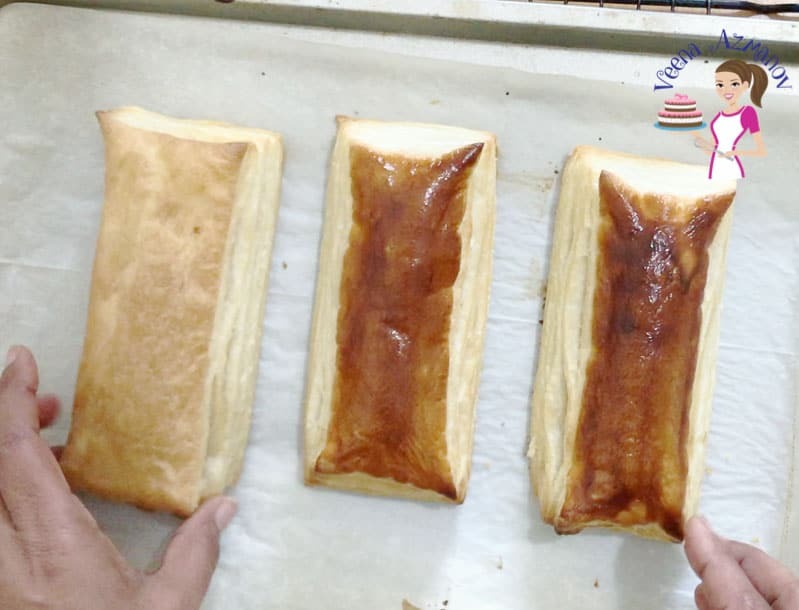 The result are thin, crispy, buttery layers of delicious pastry. They say a classic puff pastry has about 729 layers of folded dough (but looks like thousands). 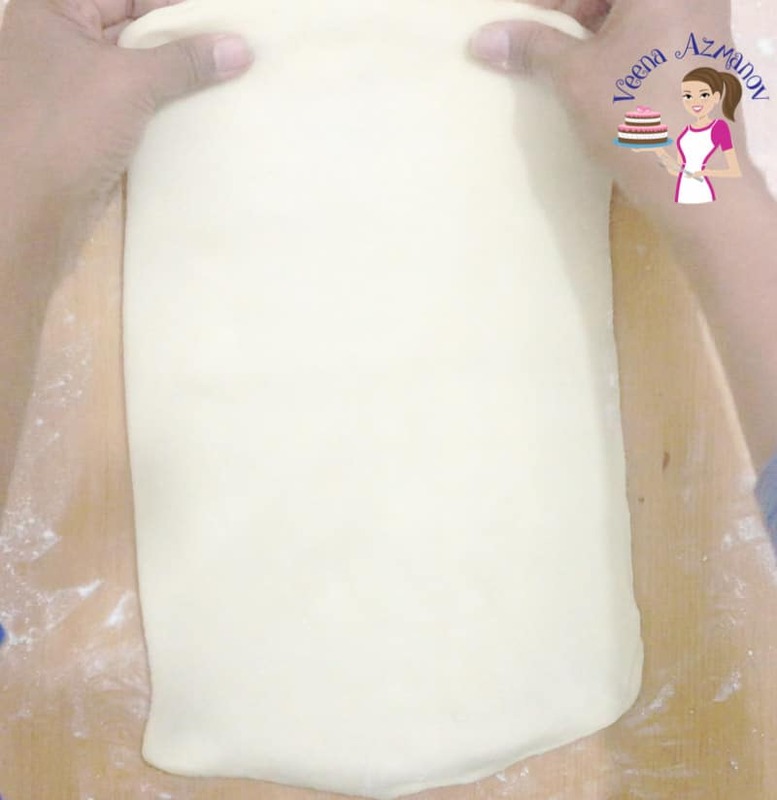 Why make homemade puff pastry? To some people puff pastry is just an ingredient you buy at the supermarkets. 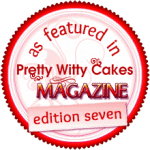 So often people are surprised when they hear about homemade puff pastry. Why? Why would you make puff pastry at home? Well, first of all, there ain’t nothing like homemade puff pastry. That fresh puff pastry that just melts in the mouth. Crisp, flaky and tender. And if you’ve ever tasted homemade fresh puff pastry, you know exactly what I’m talking about. Also, often you will get pastry chef’s who proudly make puff pastry from scratch. And rightfully so, it does require patience and skill. And then there are those who make puff pastry because they can’t buy puff pastry in the supermarket. I learned to make puff pastry from scratch, years ago, when I lived in India. Back then we could not buy puff pastry off the shelf (now you know what I meant by appreciating that you can buy puff pastry off the shelf). So we had to make it ourselves. Where did I learn puff pastry? Back then, it was a well-guarded skill and those who knew how to make it refused to teach me. 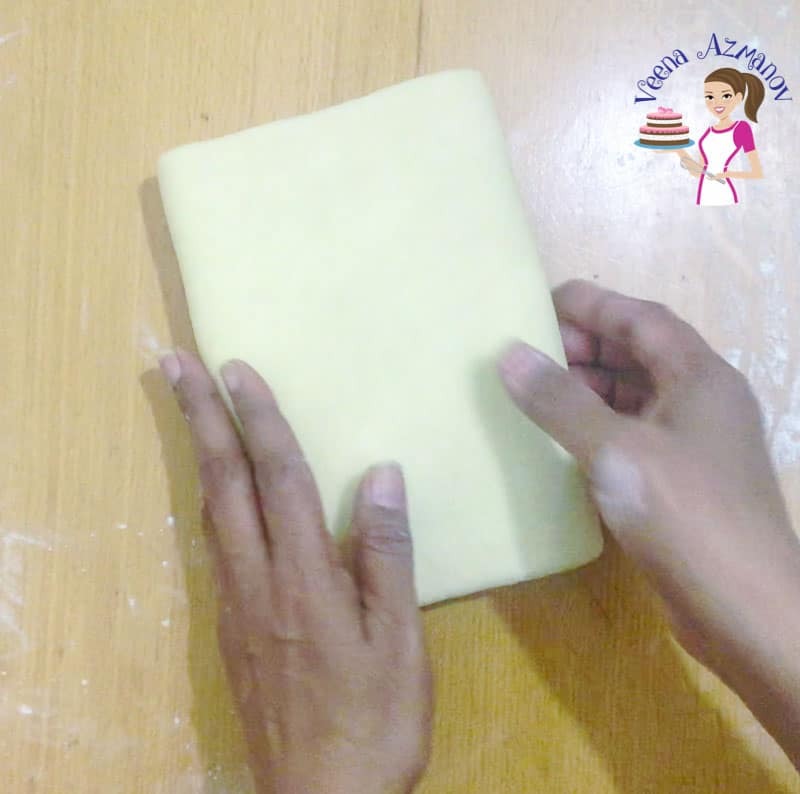 I remember the first time I made puff pastry – I rolled a few sheets of dough and brushed each with butter/flour mixture. Then, I Stacked them up and rolled them again. Of course, that only gives you big bulk layers that do not look anything like real puff pastry. I tried that method because I was told by another lady that that’s how she makes it. Consequently, I didn’t learn puff pastry that day. And yet, what I learned was that if you don’t want to share your recipe with someone, graciously say you can’t share it. Don’t mislead them or give them the wrong recipe. Her selfishness is what led to my selfless blog, where I share my recipes and knowledge so others like me can learn. Then one day, I happen to see an international dessert book at a friend’s place that showed how to make puff pastry and croissants. So I made notes… I practiced and practiced and practiced… and finally, one day I was happy with my results. Since then I have been making puff pastry with pride. So yes, for me it was necessity and passion that made me want to learn how to make puff pastry. And yet, this does not mean I don’t use store-bought puff pastry. Heck yes, quite often in fact. Store-bought puff pastry is a luxury and you must never feel guilty to use it. And yet, sometimes when you feel that need to go beyond and make it homemade, that’s when this no-fail method will come in handy. Did you know that making homemade puff pastry is really easy? Yes! The honest truth is that making homemade puff pastry is easy, and yet it is time-consuming. Because the process involves folding the dough over a few times (6 times) with 15 minutes intervals. So, what do you think? It’s difficult? Nah!! 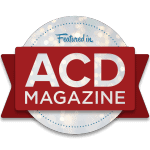 Time-consuming – yes! There are four common types of puff pastry. Full, half, three-quarter and inverted puff. Where full, half and three quarters refer to the ration of fat to flour. 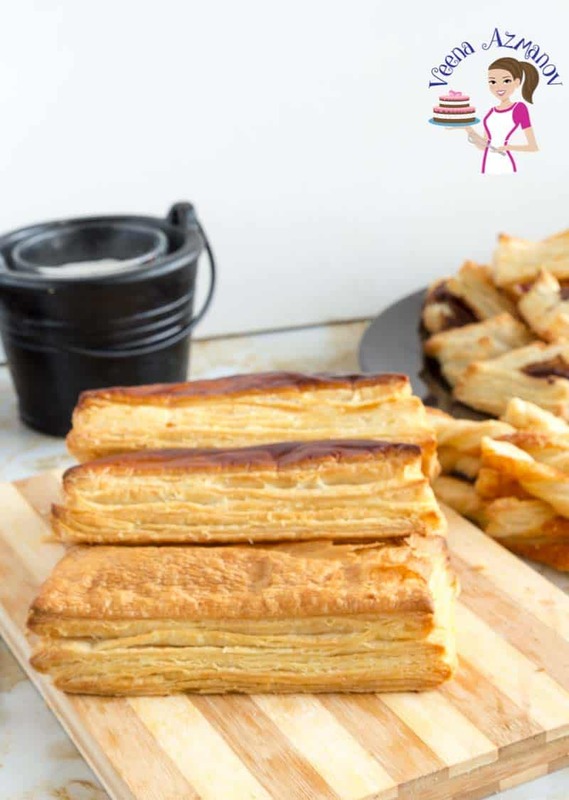 For example, this recipe is a classic puff pastry, which is referred to as full puff pastry. And it uses an equal amount of flour and butter. While the half means that the weight of fat is half of the weight of the flour, and so on. The inverted puff is also known as upside-down puff pastry. In which the dough in encased in the butter block. Yes, sounds complicated, and yet it is possible while it does take a little practice and getting used to. Are Puff pastry, Croissants, and Danish pastry the same? No, they are all laminated dough, meaning they are all layers of flour and butter, and yet they are all different from each other. Puff pastry has no yeast and no eggs. Croissant dough has the addition of yeast and is made with milk just like bread, but with lamination. Danish pastry has yeast as well as eggs. While puff pastry goes thru 6 folds, a croissant goes thru just 3 or 4 folds, and a Danish pastry has about 3 turns as well. Lastly, puff pastry has a flaky crusty quality, while croissant has a more bread-like quality and the Danish pastry has a chewier texture. Do I have to roll puff pastry to exact measurements? The measurements are the one issue that often scares people and make them afraid to try homemade puff pastry. In truth, the measurements are just guidelines. 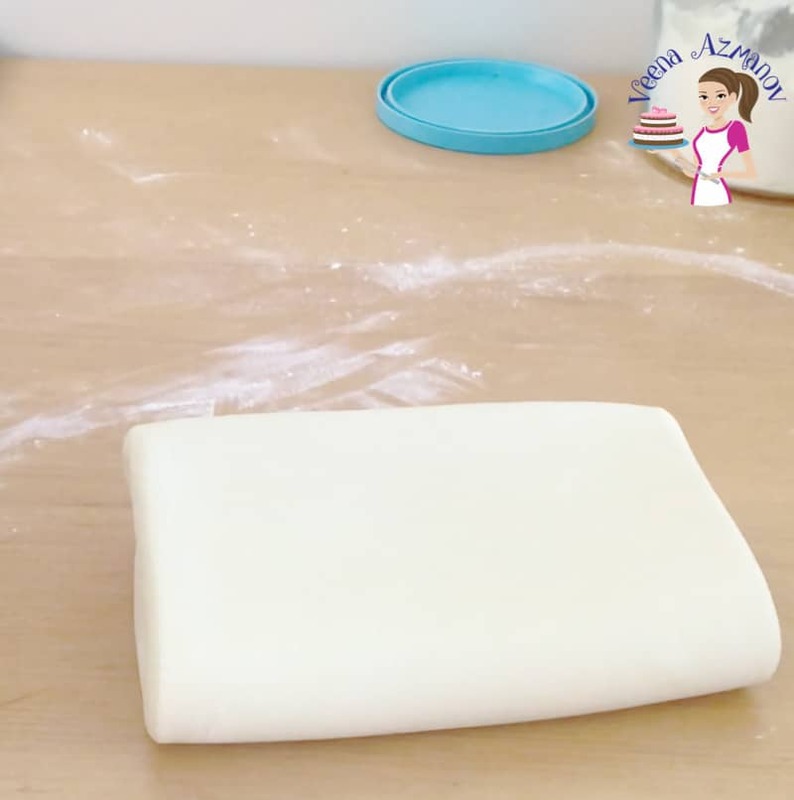 You want to roll the dough to a long rectangle that’s twice the size of your butter plus an inch around to seal it. 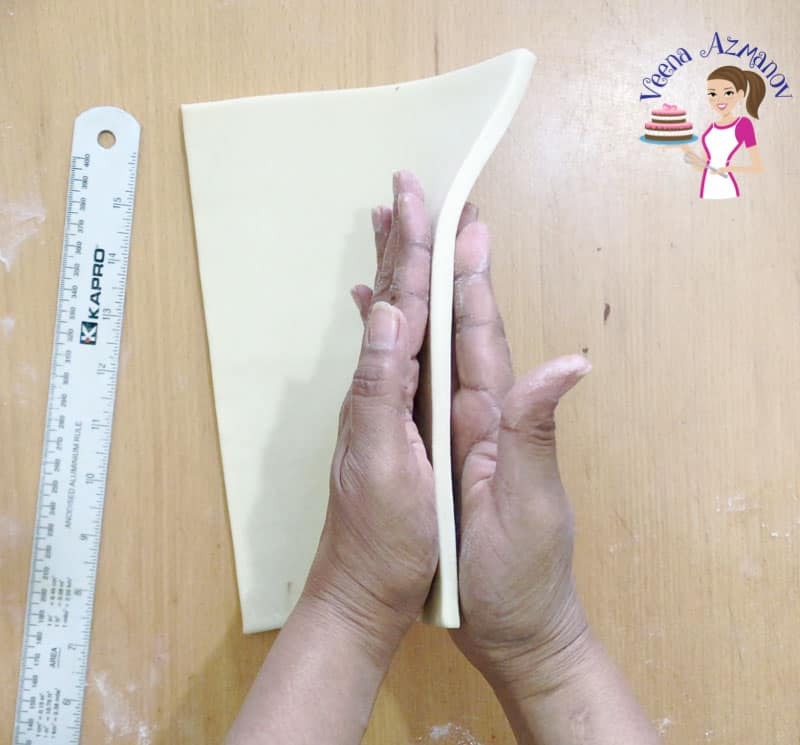 So, in this case, my butter is a 6-inch square, which means I need to roll the dough to a rectangle of about 13 inches long and minimum 7 inches wide. Do I have to fold the puff pastry like a book? Again, the folding technique is a guideline. And it is meant to ensure that we get as many layers as possible from this number of folds. There are a French, English and a Scottish method. And no matter what method of folding you use, book fold, letter turn, double turn or combination method, depends on what is easier for you. The folds will help you create layers and layers. I find the book fold to be the easiest and most fuss-free method. Do I have to fold the pastry six times? As I said above, puff pastry is folded 6 times to get as many layers as possible, while the croissant or Danish is rolled only 3 to 4 times. 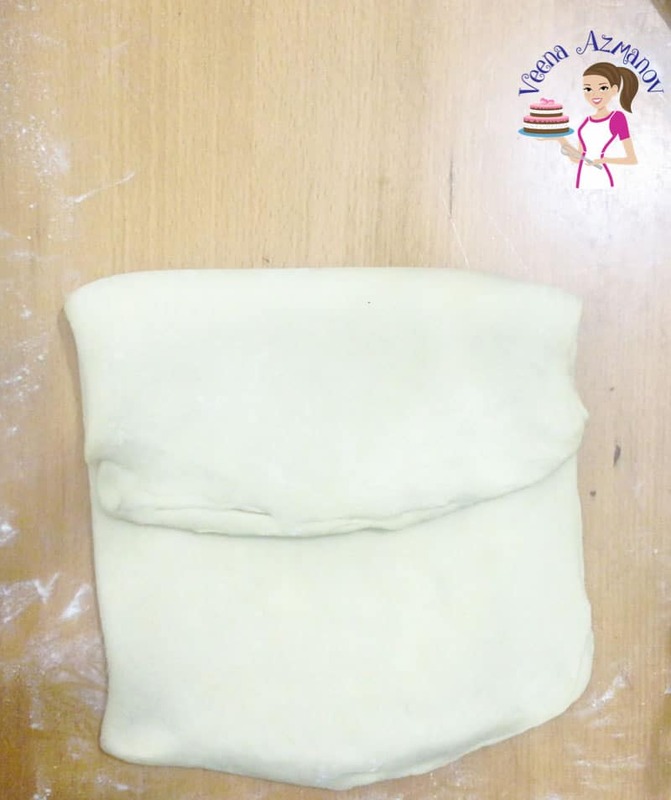 Therefore, you can roll the puff pastry fewer times and it will have fewer layers. And yet, it will still be delicious because it’s homemade. Also, it is not recommended to go more than 7 folds as that may cause the layers to blend into each other. Butter – The best butter for laminated dough is one with less moisture. Like a good quality European butter. High in fat and low in water content. Flour – Strong bread flour is usually recommended when making a laminated dough. 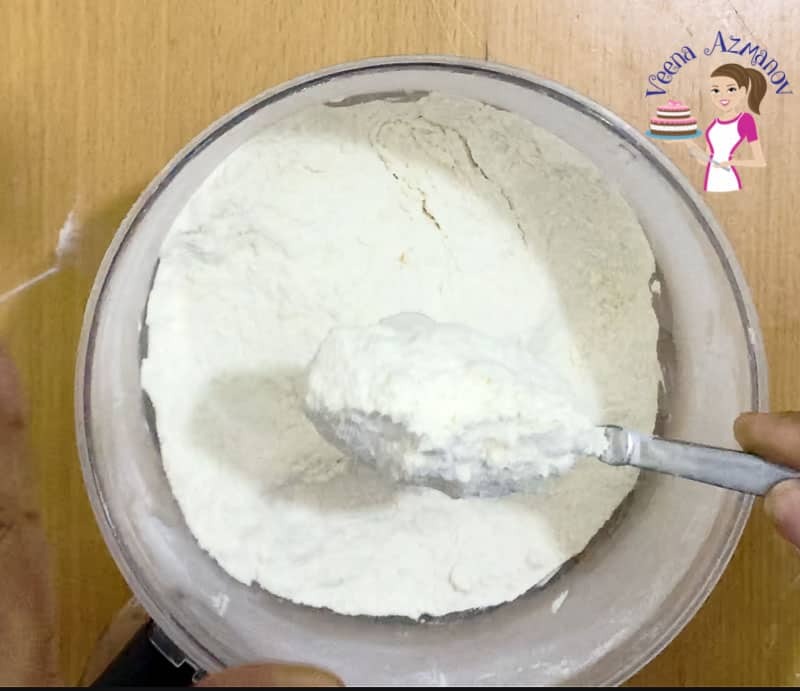 Bread flour has a protein content of 1.5 to 12.5 %, which provides the strong gluten structure needed to trap water vapor as the pastry is baking, thus creating a nice flaky texture. All-Purpose flour can also be used instead of bread flour. For the first 10 years, I made puff pastry with only all-purpose flour because bread flour was not available. 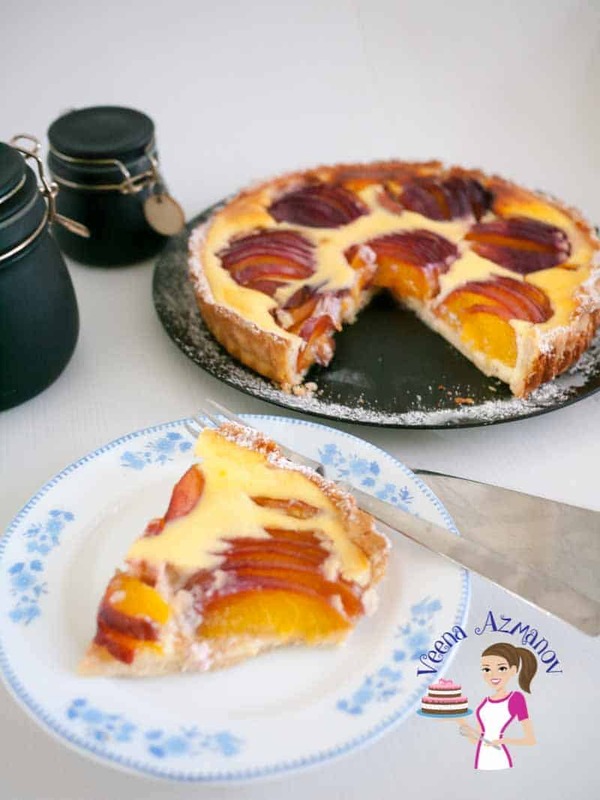 Sugar – Helps the dough with water absorption. It also adds sweetness, flavor, and tenderness to the dough. 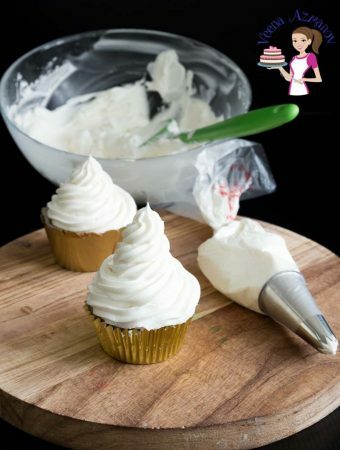 Liquid – You can use water, milk or cream to make puff pastry. Personally, I like using water or milk, but not cream. I find that cream makes the baked pastry darker than golden brown. My favorite equipment when making any pastry is thefood processor. We need to cut the butter into the flour until it reaches bread crumb consistency. 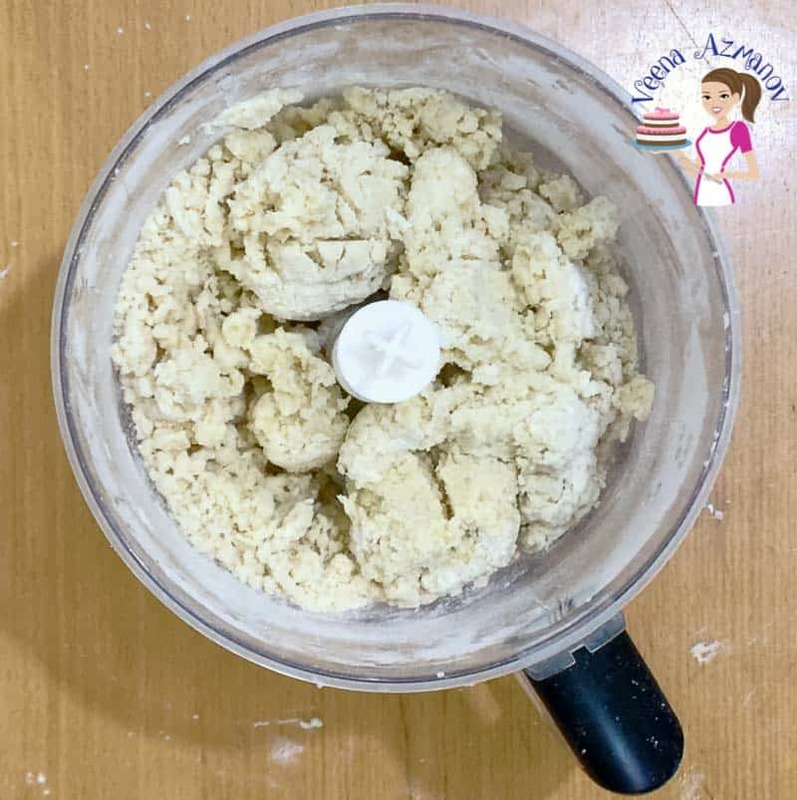 I find the food processor gives an even distribution of butter in the flour making a very stable dough that’s easy to roll without any large chunks of butter. And yet, I’m not one to rely on equipment, so, a simple chilled bowl and your fingertips are really all you need to make a good pastry. Also, using a fork or a pastry blender makes it easier on the fingers. 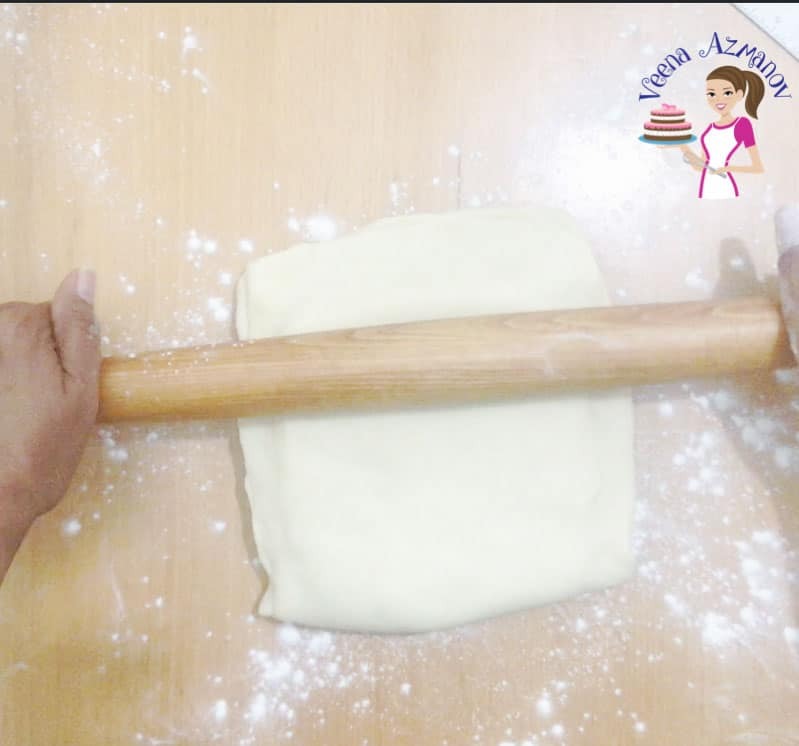 A good rolling pin is an important part of rolling this pastry. I use my French rolling pin and yet any standard rolling pin works just as well. Often pastry chef will use a metal rolling pin because it keeps the dough chilled. A pizza cutter is the best tool to cut puff pastry. 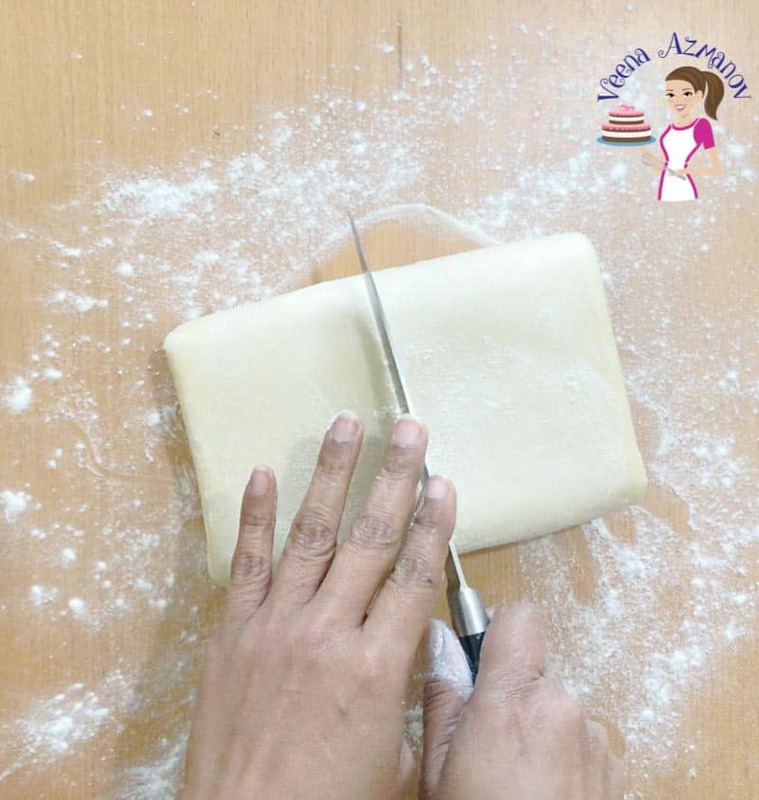 Avoid using a knife to cut pastry and if you do, do not drag or saw with the knife because it closes the edges of the pastry and prevents it from baking into open layers. 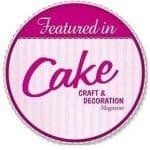 Instead, make a clean top-down cut so the layers stay defined and bloom into wonderful layers when baked. Also, good baking trayworks best to transfer the dough from surface to fridge. Covering the dough with cling or plastic wrap is a must when chilling in the fridge to prevent the dough drying out. In a food processor add flour, salt, sugar and cold chilled butter. Pulse 30 seconds – mix well – and pulse for another 30 seconds. 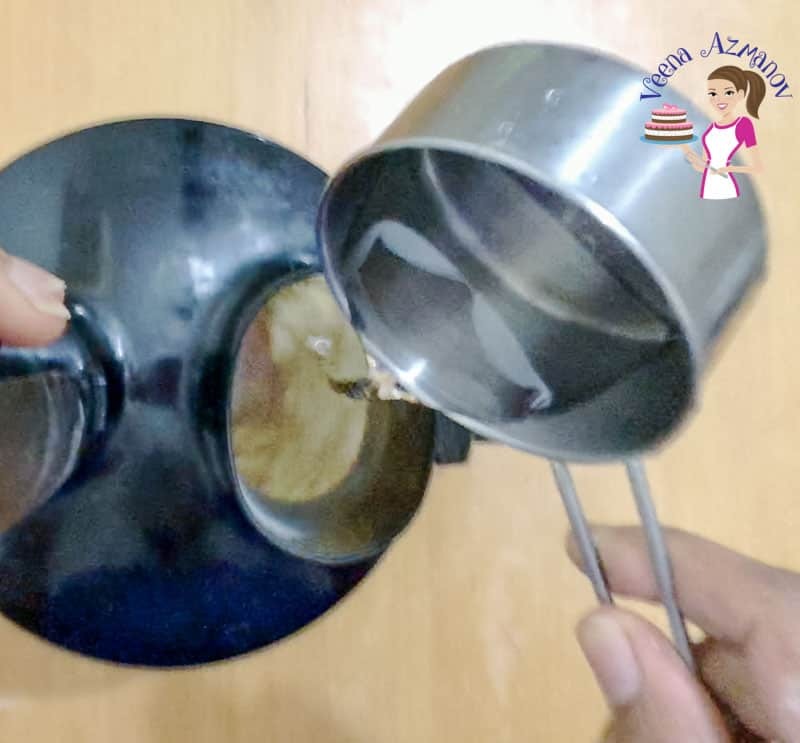 Gradually add liquid thru the food tube while pulsing at the same time. Open the food processor and remove the crumbly mixture onto a clean work surface. Gather it all into a ball and knead for 2 minutes. 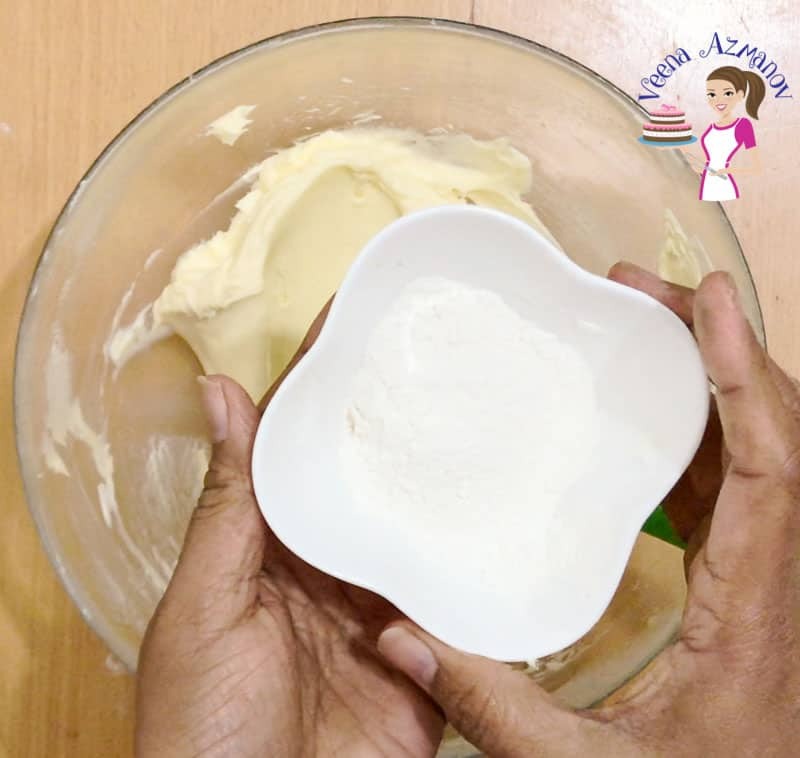 Tip – The kneading helps to add elasticity and gluten, and yet you don’t want to over knead the dough like bread. So knead for just about 2 minutes until it’s smooth. 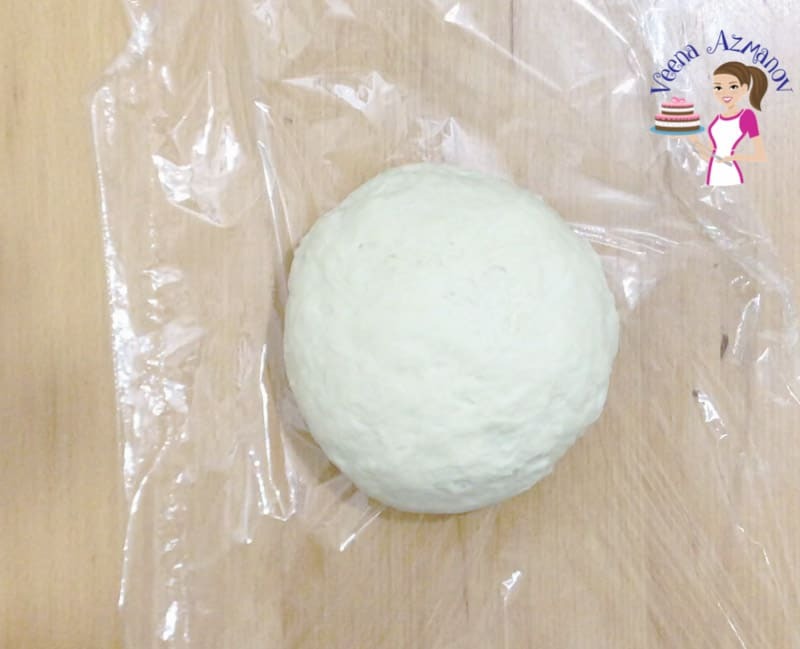 Wrap the dough in a cling/plastic wrap and let rest in the fridge for at least 30 minutes. Place the flour, salt, sugar – and combine well. Add chilled cubed butter to the bowl. 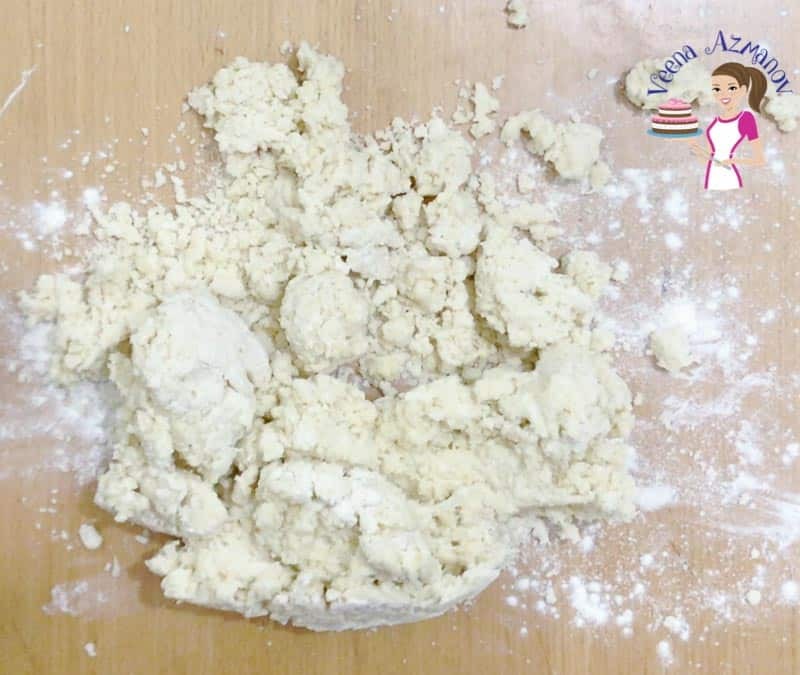 Using your hand, fork or a pastry blender – cut or rub the butter into the flour until it resembles breadcrumbs (similar to when we make pie crust). Add water a little at a time – bringing it all together. Gather it all into a dough and knead for 2 minutes. 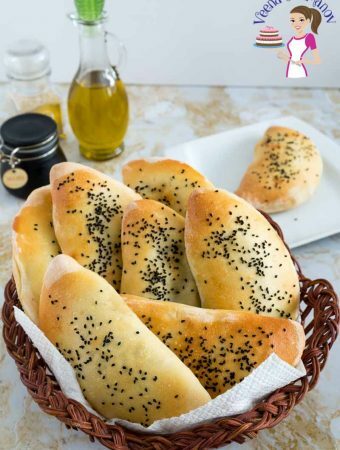 Tip – The kneading helps add elasticity and gluten, and yet you don’t want to over knead the dough like bread. So knead for just about 2 minutes until it’s smooth. Place the room temperature butter in a bowl. Add the flour and cream for another 30 secs. Transfer to a 6 x 6 plastic/cling wrap lined square baking pan. Spread to all the corners of the pan so you have a thin 6-inch square. 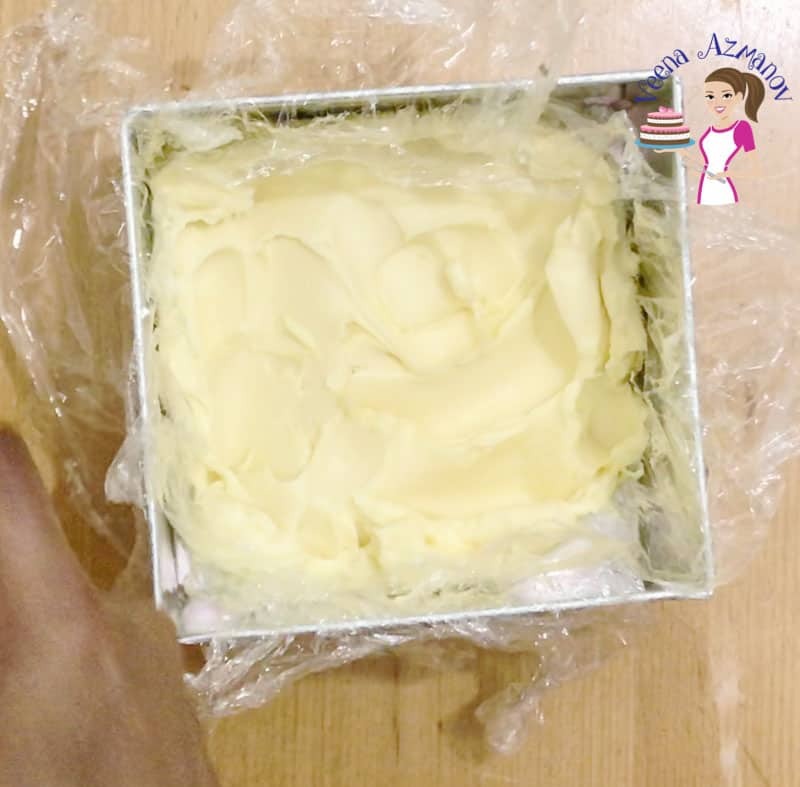 Use the cling wrap to cover the butter well and leave in the fridge for at least 30 minutes. Make sure the dough and butter block are both chilled but not hard. If necessary leave them on the counter for a few minutes. 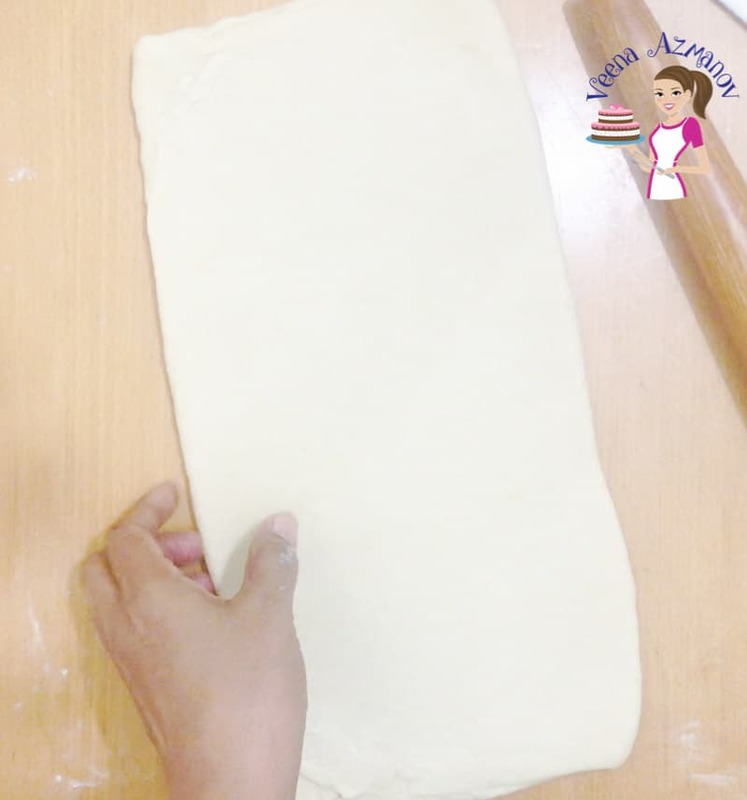 Roll the dough to a long rectangle about 13 x 7 inches (13 inches long and 7 inches wide – see notes above). 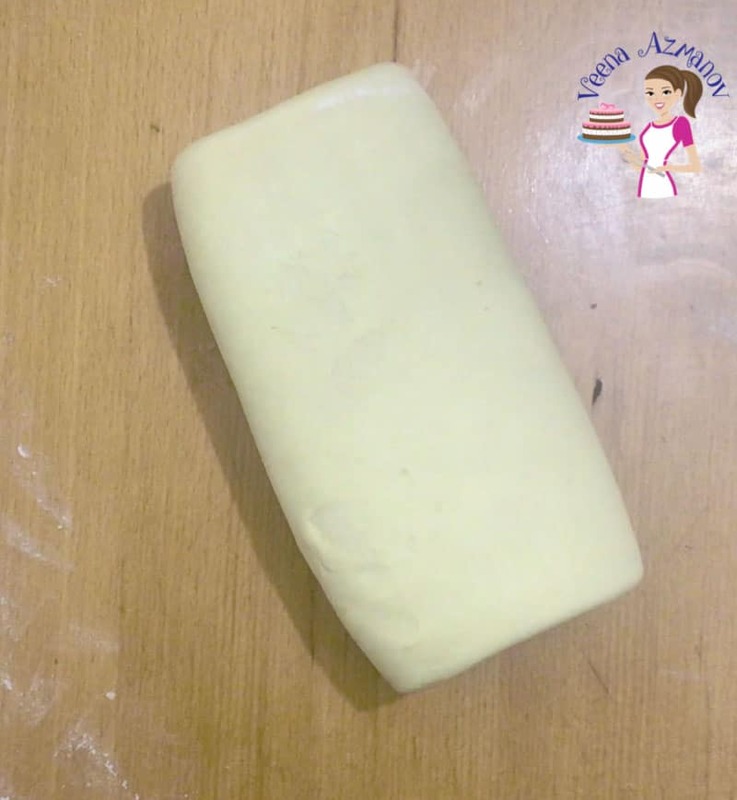 Place the butter block on one side of the dough. Flip the other side over and seal the edges. 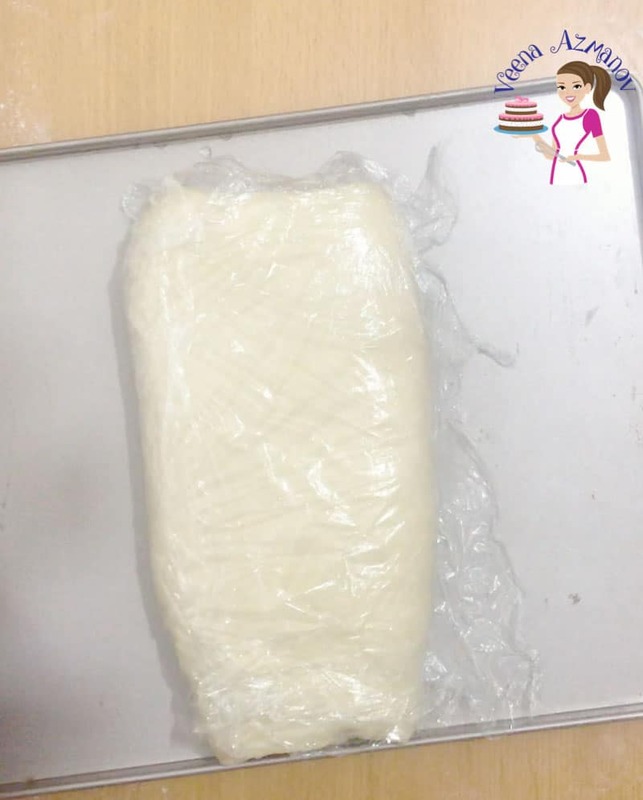 Wrap the dough in cling/plastic and place it back in the fridge for 15 minutes. 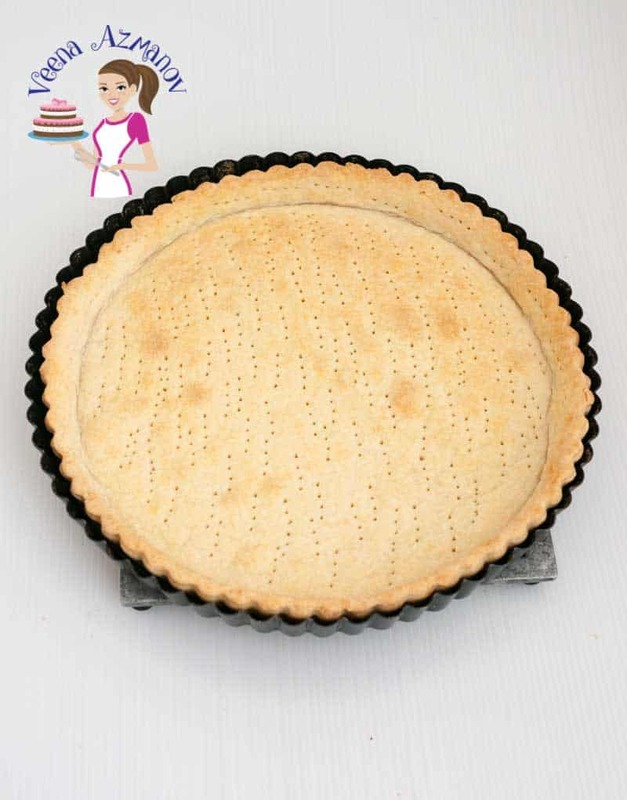 Place the dough on a lightly floured surface so the seam is towards the top. 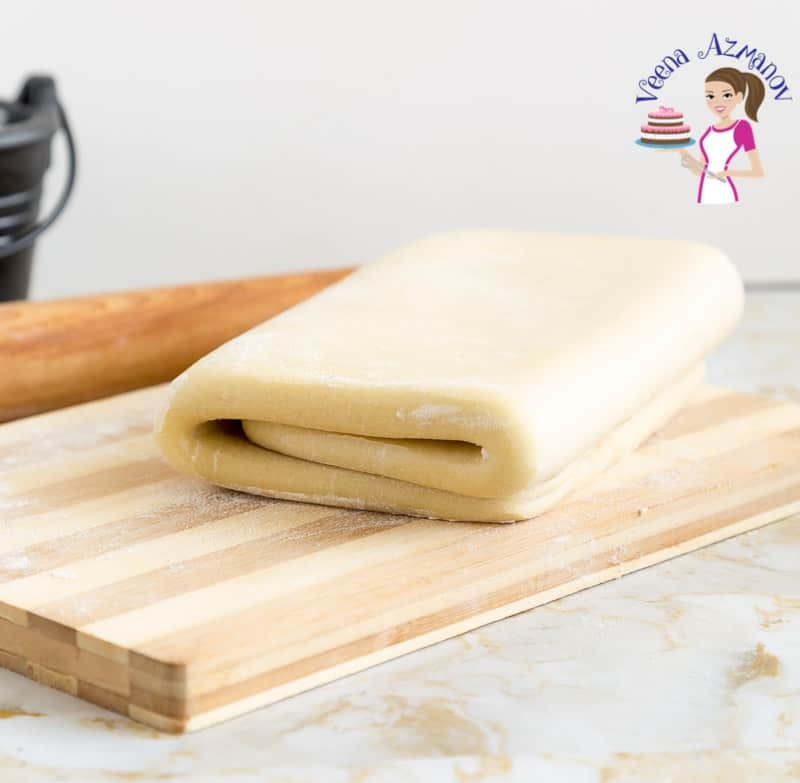 Start by lightly tap the dough with the rolling pin on the top surface – this will soften the butter inside preventing it from cracking. (which usually happens if you just start rolling). Tap from bottom edge to the top – gently. Do it no more than 2 times. Then roll the dough to approximately 20 x 10 inches long. To create the fold imagine you are dividing the dough into thirds. Just like a book – Fold the top third to the middle. Then fold the bottom third over the middle. This is your first fold. Repeat this process of tapping, rolling and folding five more times. Total of six folds. And making sure to chill between each or between every 2 folds. 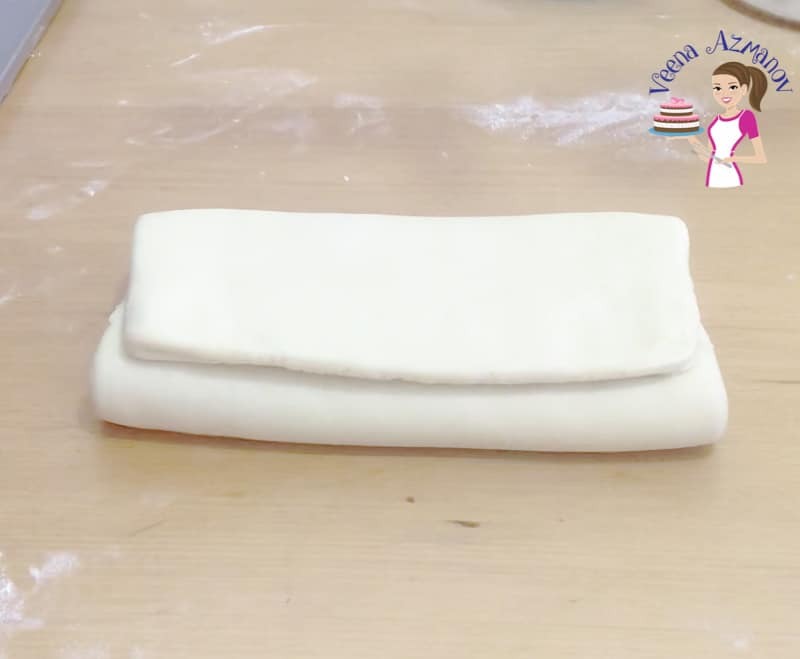 If the dough is cold and relaxed you can do two folds at one time. In winter, I manage two folds. But in summer I do one fold at every 15 minutes chilling time. 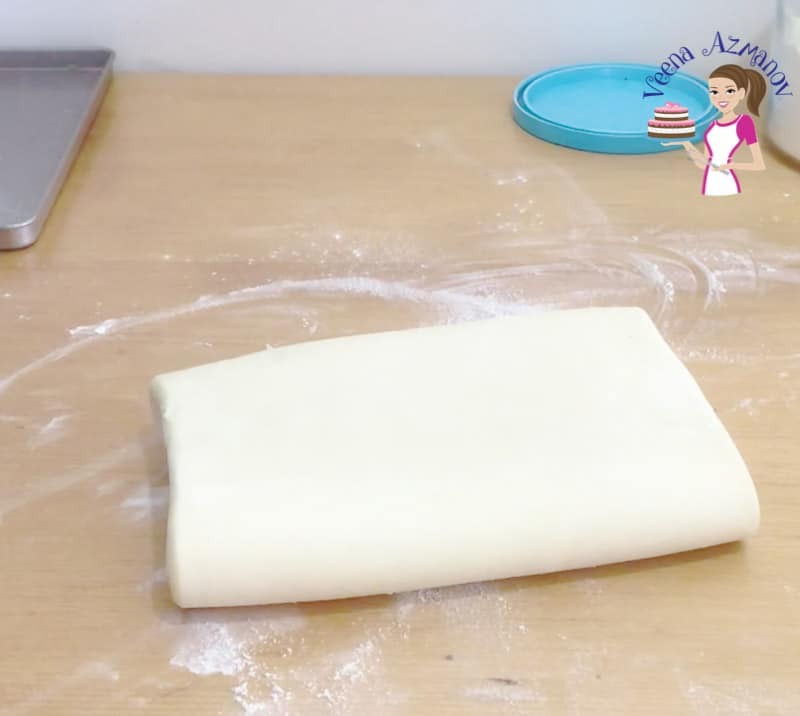 After the last fold – the puff pastry needs to rest for at least an hour. This is now ready to be used in any recipe that calls for puff pastry. I prefer to cut this dough in half and wrap each half separately. These can be kept in the fridge for a few days (4 to 5 days). If you are not going to use it soon – wrap well and freeze them for months. Thawing in the fridge overnight works best. Always keep puff pastry cold at all times. This is the best way to create and preserve those layers of flour and butter. If the dough warms up too much, then the two will combine together and blend into a single dough ruining any layers you may have created. 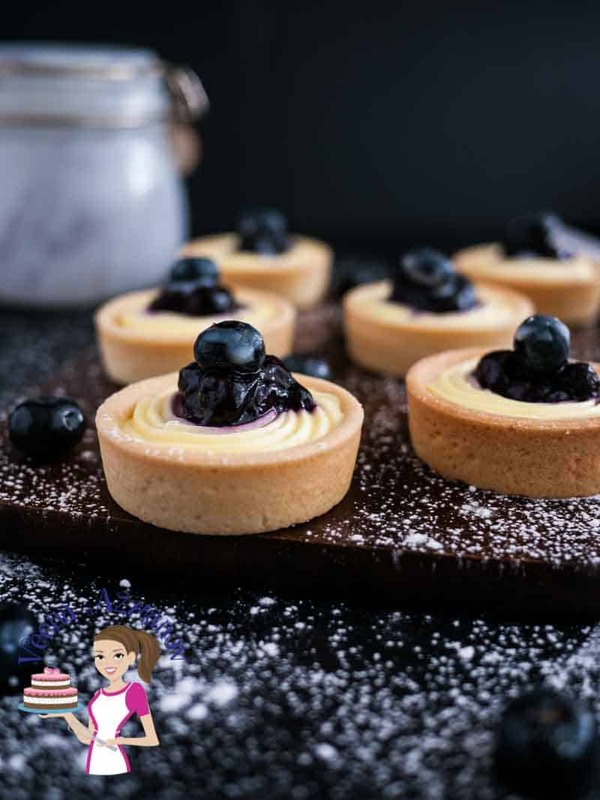 Don’t skip the resting time – This is important not just so the butter stays cold but it also helps the gluten in the flour relax, making it easier to roll again. The un-rested dough will shrink and not roll making it difficult to keep those layers separated. If you live in a hot humid country – work on a chilled large baking tray rather than on a countertop. Place the baking tray in the fridge with the dough so it stays chilled. 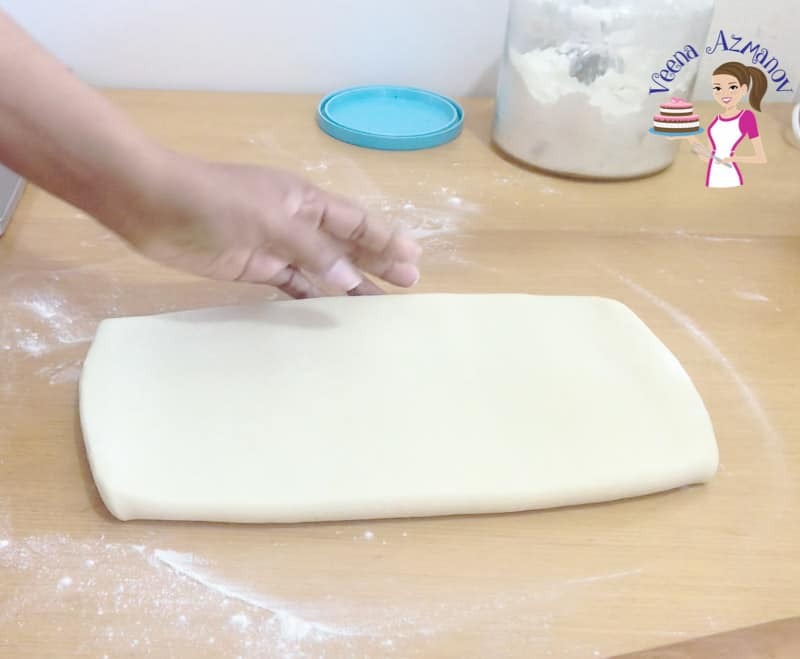 Then, bring the dough out – flip the baking tray, dust with flour and roll the dough to create the fold. Each half can be rolled to a thin sheet of minimum 12 x 12 or maximum 16 x 16 square. Rolling the sheet thin gives pretty well defined puffed edges. While rolling it thick will give you very bulky edges, which don’t look as elegant. And yet, rolling too thin will squash the layers ruining all your hard work. If you live in a hot and humid country – work in small batches. For example, if you have divided the sheet into 16 squares – work with 4 squares at a time – keeping the rest in the fridge. This will make sure you have beautiful puff pastry treats no matter what the weather is. Also, make sure your oven is preheated properly before you place puff pastry to bake. Laminated doughs must be baked at between 200 C to 220 C (400 F – 425 F). If the oven is not hot enough, the butter between the layers will melt away and the layers will fuse together ruining all the hard work you did. Can you substitute pie crust for puff pastry? 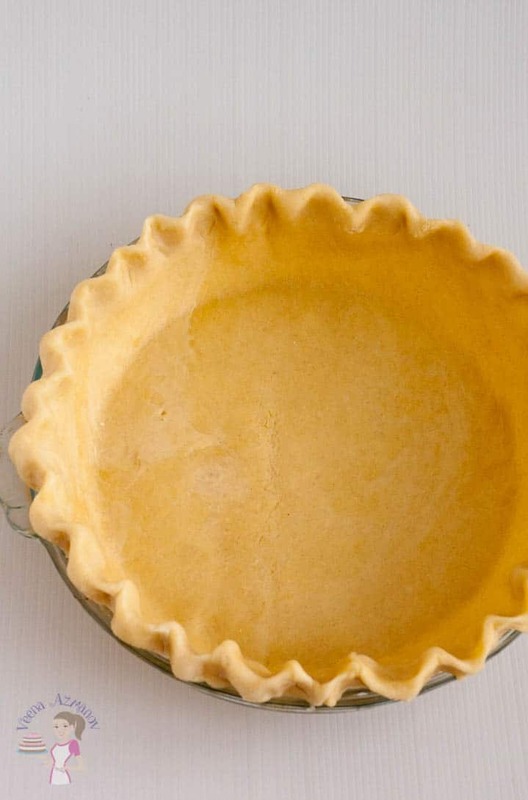 Pie crust is a buttery flaky crust with more butter in the dough and is cooked to a crisp. While puff pastry has less butter in the dough but lots of butter between the layers. So while the beginning starts off quite similar they are two completely different bases and should not be used interchangeably. Can I use margarine instead of butter for puff pastry? Honestly, if you’re going to take the trouble to make puff pastry make it the best, using good quality butter. 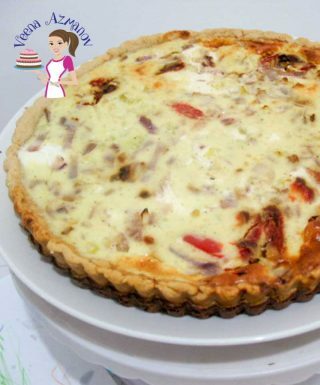 Having said that, you can use half butter and half vegetable shortening, which will give you a light flaky crust. 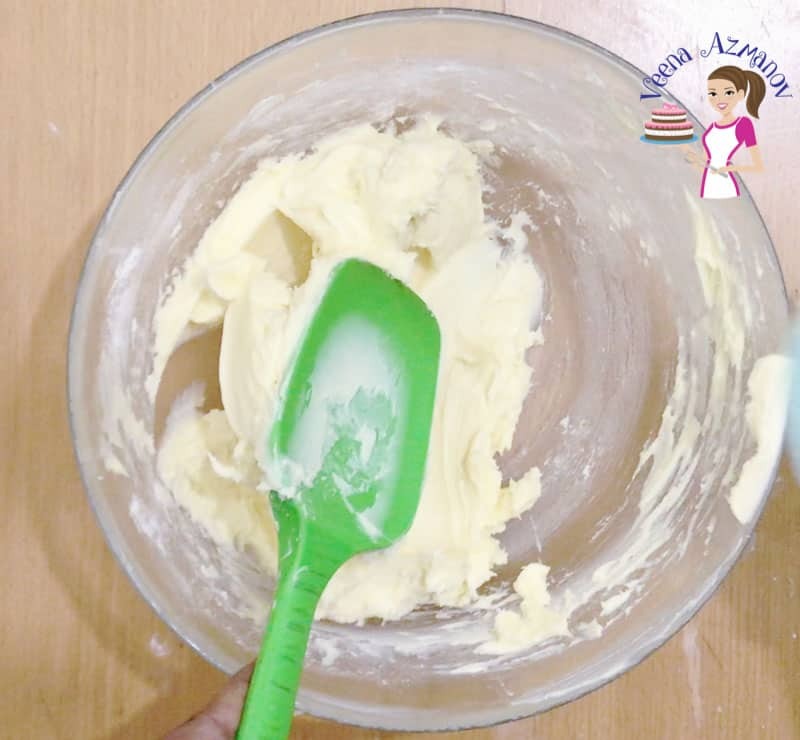 You can also use margarine, however, the high water content in margarine can make the dough tougher. So you can add a few tablespoons of extra flour to better absorb the water. 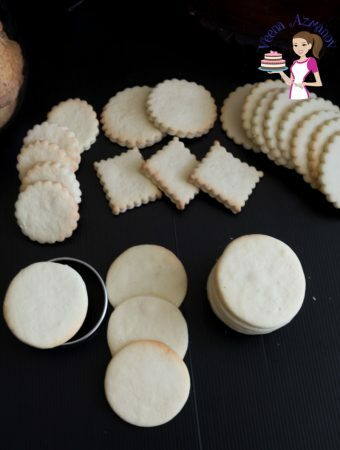 And yet, do not use spreads like butter spread or vegetable spread since they are very high in water content and will not give you the right consistency of puff pastry. Can I brush puff pastry with cream? How do I get a golden crust on my puff pastry? 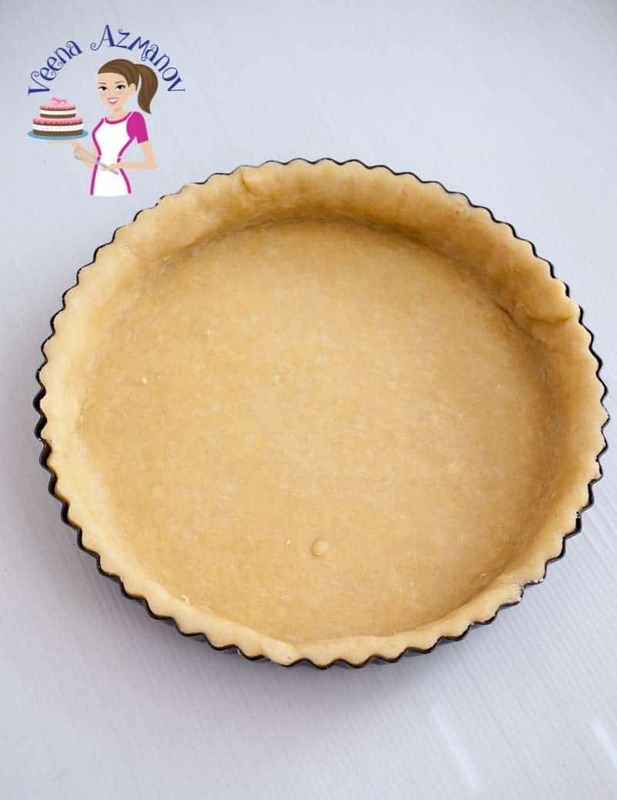 Ideally, egg wash is brushed on pastry for a nice golden color. As you can see in the picture below, I left the first piece without any egg wash, the second is brushed with egg yolk and milk, while the third is brushed with egg yolk and cream. 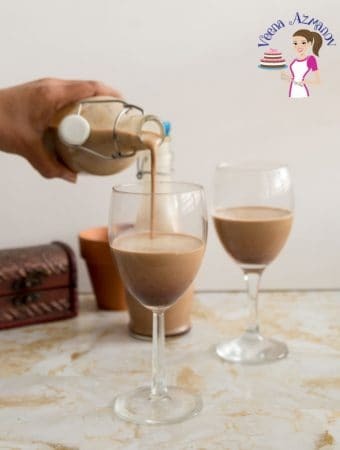 The milk solids in the milk and cream will give you a darker color when baked. While a plain egg yolk with water will be paler. There is no right or wrong with this method. It depends on how long you need to bake the pastry. I use an egg wash with water when I need to bake the pastry longer. And I use eggwash with cream for quickly baked pastry so I get a golden crust. Why is my puff pastry tough? Puff pastry does need butter in the dough as well as in between the dough layers. If you add less butter in the dough you will find that the dough is quite tough to work with. 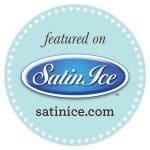 It does not roll as smoothly and will tear easily, despite being chilled. So my advice when working with puff pastry, don’t skimp on the fat. Can puff pastry be frozen before baking? Absolutely, freeze the dough in small batches individually wrapped in plastic. Or, freeze prepared puff pastry treats between layers of baking paper/parchment paper. 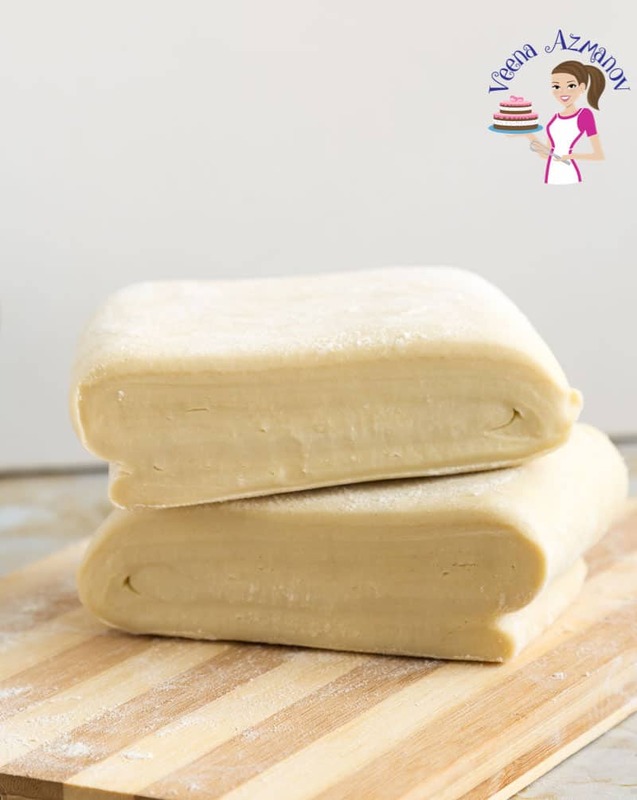 Most puff pastry treats can be frozen for two weeks. And you don’t need to thaw puff pastry before baking. The thin layers of butter and fat benefit from the high heat. How long can I keep puff pastry in the fridge? Unbaked puff pastry will stay good in the fridge for 4 to 5 days. Make sure to wrap well in plastic to prevent the dough from drying out. Baked puff pastry is best eaten fresh. Personally, I bake only as much as I need for the day and save the rest in the freezer. They are two completely different dough, and yes, in some cases you can use puff pastry instead of filo. 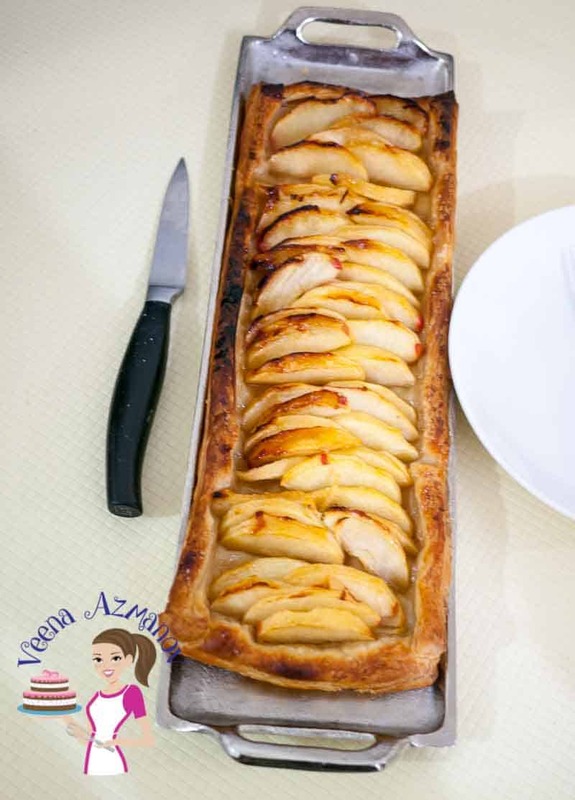 For example, you can make apple strudel with filo as well as with puff pastry. 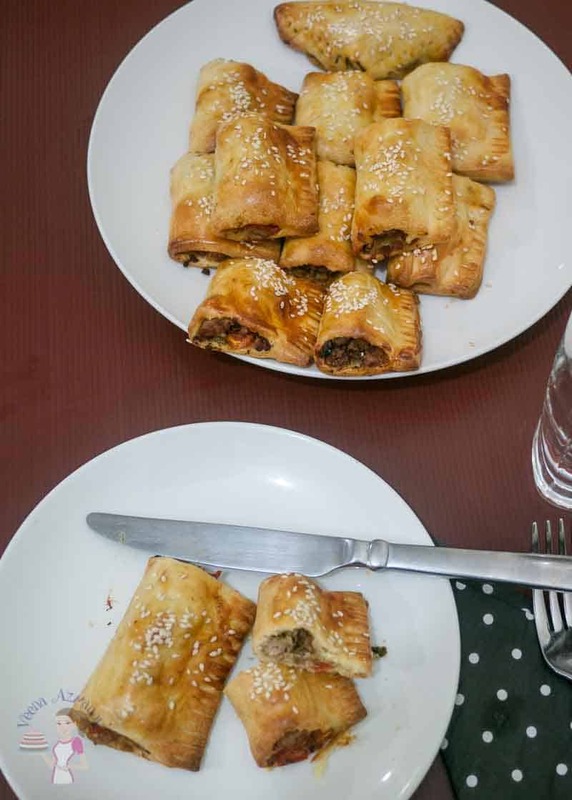 And you can also make samosa with puff pastry or filo. However, you can’t always use them interchangeably. For example, a Baklava is best made with filo and would be a disaster with puff pastry. Can puff pastry be reheated? 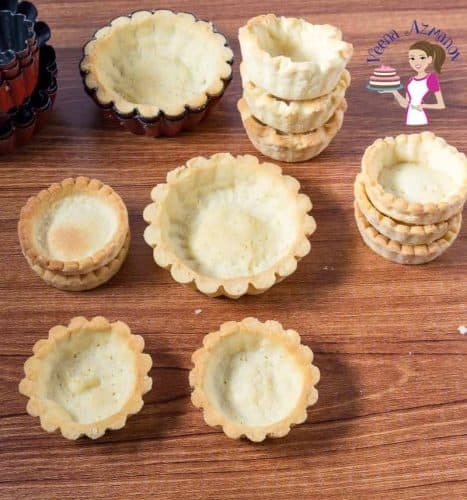 How do I reheat my bake puffed pastry treats? The best way to bring puff pastry back to life is in the oven, not microwave. Bake in a preheated oven at 200C until warm through. Does puff pastry have an expiry? While the shelf life of puff pastry in the fridge is just 4 to 5 days, its shelf life in the freezer is really long. They say a well-wrapped puff pasty in the freeze can last up to 12 months if frozen at 0° F. I have personally never kept my puff pastry that long in the freezer so I can’t confirm that. 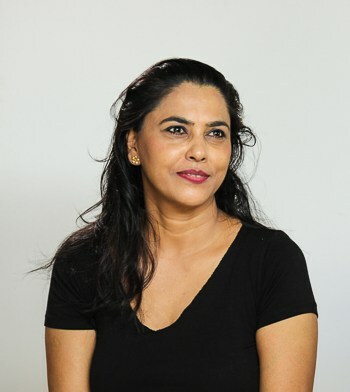 Share a picture of your work with me by uploading an image here below my image on PIN board. The classic puff pastry is the base of many wonderful pastries. 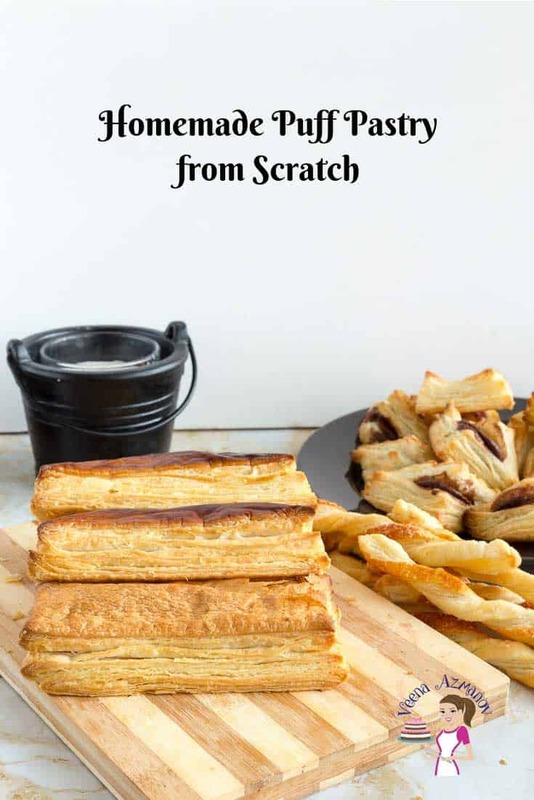 Create sweet or savory treats, breakfast to desserts, using homemade puff pastry. And it's flaky, buttery, and much better than store-bought. 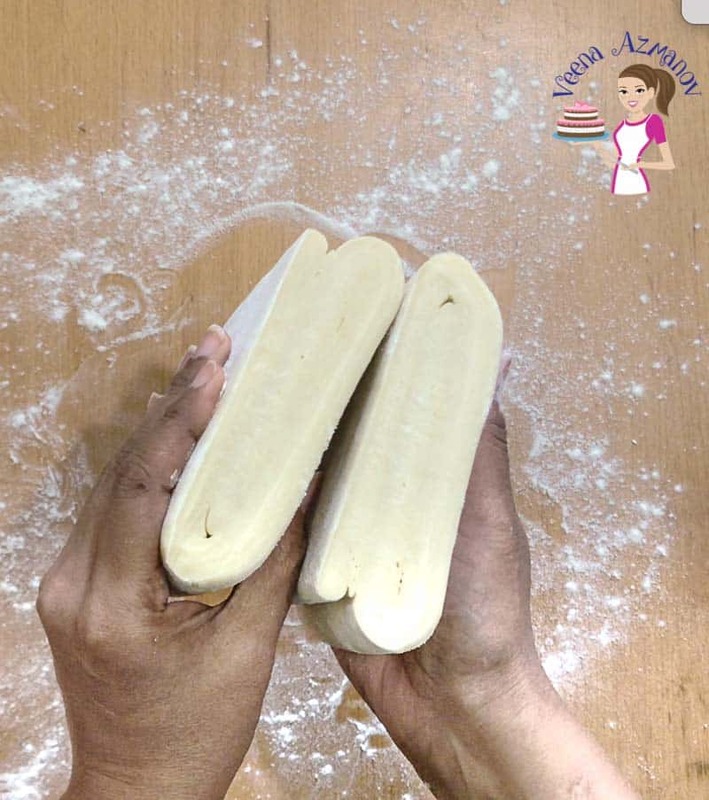 Learn to make puff pastry from scratch using my no-fail method, step-by-step progress pictures, and video. Pulse 30 seconds - mix well - pulse for another 30 seconds. Open the processor and remove the crumbly mixture onto a clean work surface. Tip - The kneading helps add elasticity and gluten but you don't want to over knead the dough like bread. So knead for just about 2 minutes until it's smooth. Place the flour, salt, sugar - and combine well. 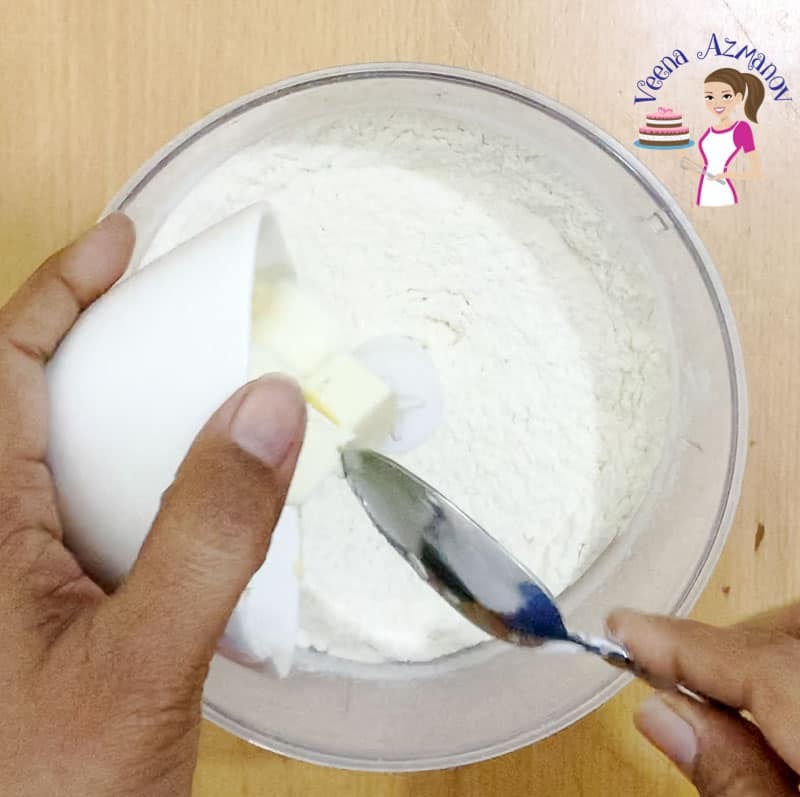 Using your hand, fork or a pastry blender - cut or rub the butter into the flour until it resembles breadcrumbs (similar to when we make pie crust). Add water a little at a time - bringing it all together. Roll the dough to a long rectangle about 13 x 7 inches (13 inches long and 7 inches wide - see notes above). 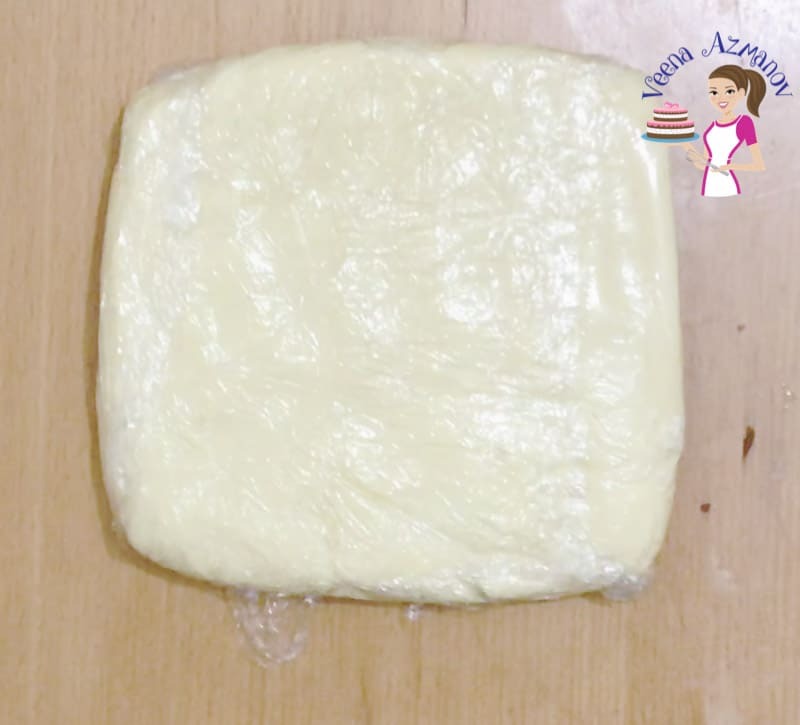 Place the butter block on one side of the dough - flip the other side over and seal the edges. Start by lightly tap the dough with the rolling pin on the top surface - this will soften the butter inside preventing it from cracking. (which usually happens if you just start rolling). Tap from bottom edge to the top - gently. Do it no more than 2 times. Just like a book - Fold the top third to the middle. Wrap in plastic wrap again and chill for 15 minutes. Total six folds making sure to chill between each or between every 2 folds. In winter I manage two folds but in summer I do one fold at every 15 minutes chilling time. After the last fold - the puff pastry needs to rest for at least an hour. If you are not going to use it soon - wrap well and freeze them for months. Thawing in the fridge overnight works best. I have always purchased puff pastries at the store because I thought they were so difficult to make. You have proven me wrong and now I can’t wait to start baking. Super helpful post! 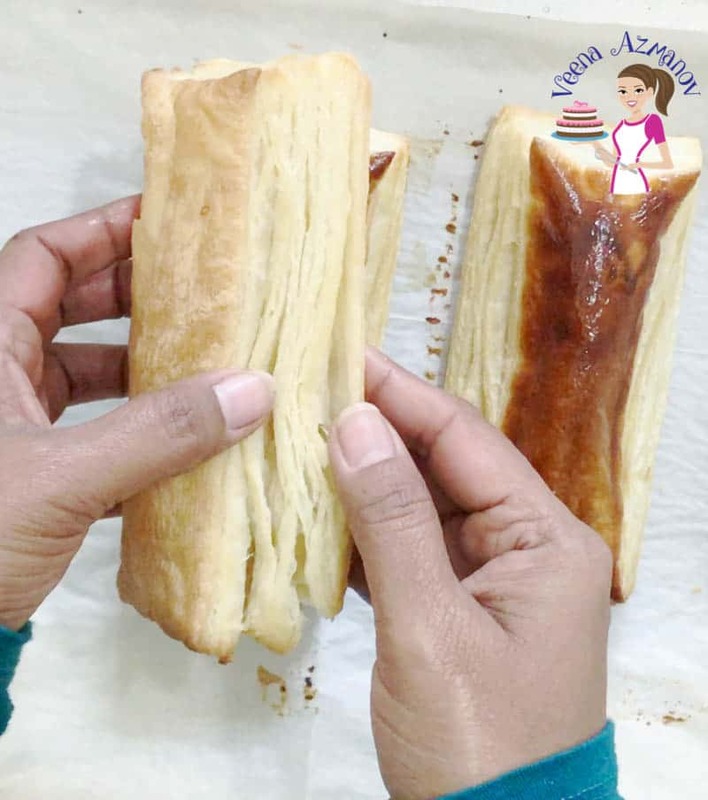 I’ve always wondered if I can easily make my own puff pastry but never tried. You’re post and recipe is now inspiring me. And that apple tart! Ok, yum!! 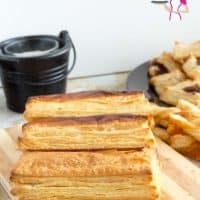 I love using puff pastry, I didn’t know that it was so easy to make it at home. Thanks so much for this recipe. Thank you, Pearl. Glad you enjoyed this post. Wow! 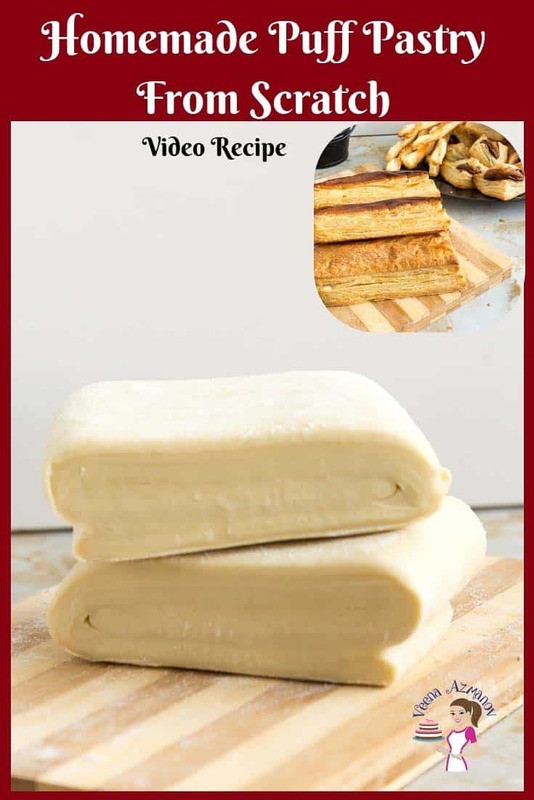 I have always wanted to try making my own puff pastry from scratch. This sounds perfect!! I am saving this for later to make! 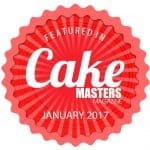 I love a good classic recipe and I think I have found it. A great way to impress guests. I always buy puff pastry, but would love to make my own. This looks so delicious and flakey, and the step by step process and video are super helpful! 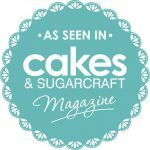 Great for a puff pastry beginner like me!! I made my own puff pastry a few years ago, and you’re right – so much better than store bought! 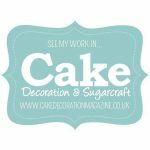 Such a detailed step by step post – you’ve convinced me to make some more!! My kids really loved it! Thanks for sharing the recipe! Thank you so much, Toni. Now that’s what I call a delicious puff pastry! How gorgeous yours turned out and what dedication to take the time to make something so delicious and beautiful. I have to say that I bet I could make this pastry from scratch after your great tutorial and I realize how spoiled I am that I can purchase it already to go at the store. Thanks for the great lesson! 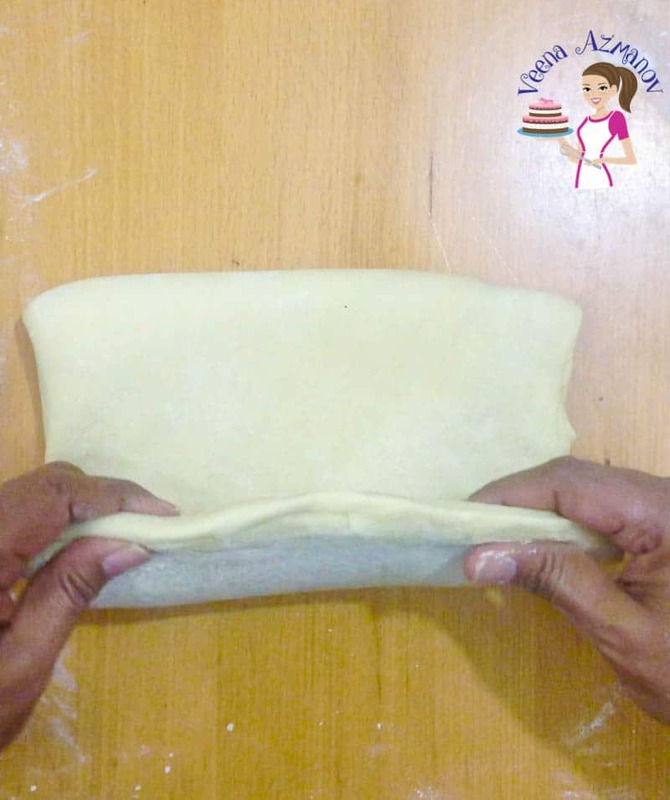 Very handy to know how to make this puff pastry! One of my son’s favorite! Pinning this for future reference! I love puff pastry but don’t make it as often as I should. This is a great step by step guide. How have I never even thought of making my own puff pastry? This is so clever. 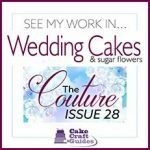 I love all of your step-by-step instructions and photos, it will make the whole process so much easier! Thank you, Katherine. Yes, so easy. 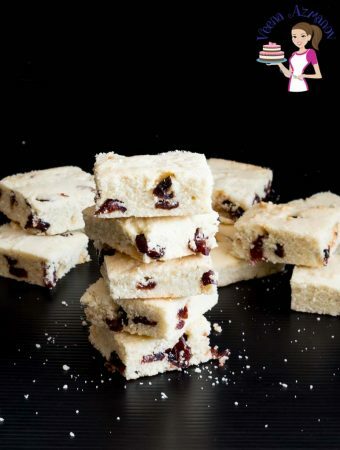 This is such a great recipe to have in the box! The possibilities with puff pastry are endless! Thank you so much for sharing this! You are welcome, Krista. Happy you liked reading it. Wow! Now this is a thorough post!! Making puff pastry isn’t easy (I’ve only done it once!) but seriously everyone will have success making it with your photos, tips, and video! Thank you, Heather. Happ you found it useful. Oh wow, you got the perfect puff! I admit to being lazy and grabbing the frozen sheets if I need some puff. However, you make it look quite possible to make! LOVE the detailed instructions! Thank you, Marie. Glad you found it useful. Wow, from scratch, that looks amazing! This is a must try. Will be adding for later, maybe this weekend? Wow! 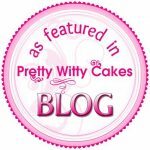 I can’t believe you have made your own puff pastry! You have given such great instructions, I may even be ready to tackle this, as well! Thanks for a great tutorial! Thank you, Noel. I hope you give this a try. 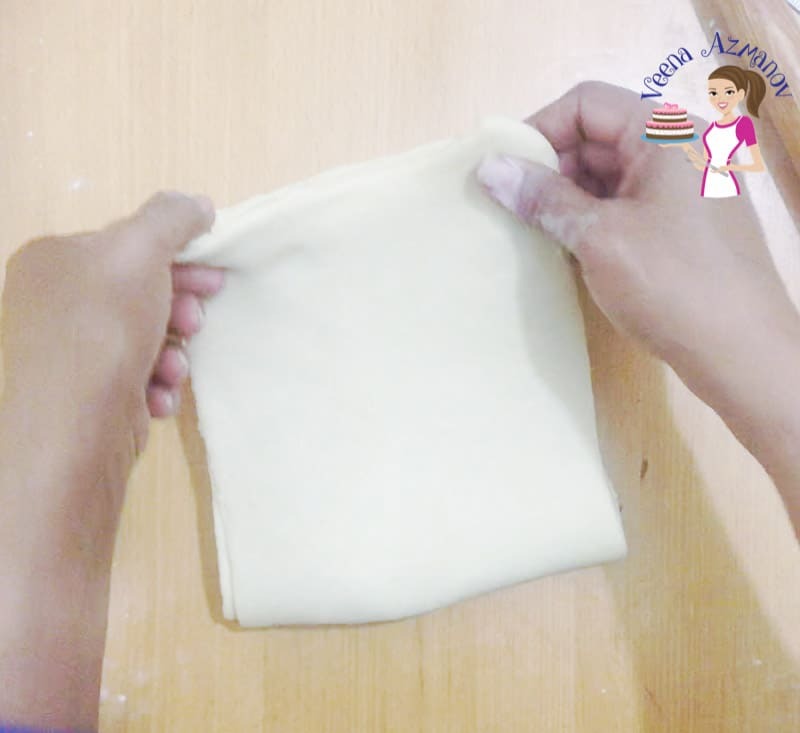 I have never made puff pastry from scratch but your video and thorough step by step instructions will make my first time much easier. Thank you, Kelly. There is always a first time for everything. Glad you found this useful. Thank you for walking me through this step by step. All of your tips and tricks are so helpful. Can’t wait to try it. I love how detailed this is! I’ve only made it from scratch a few times but it so makes the difference than buying store bought! Excellent tutorial! Definitely, homemade makes a huge difference. Look at those flakey, buttery layers!! My mouth is watering already. You’ve convinced me that I can in fact make my own puff pastry at home! Love the step by step photos. Pinning for later! Thank you, Kylie. I hope you give this is a try.